It’s May 1997. Tony Blair has won the election and Katrina and the Waves have won Eurovision. Channel 6 is a month old. No one knows who Harry Potter is. Britain is the coolest place in the world. At the local secondary school it’s a different story. Miss Belltop-Doyle can’t control her Year 10s, Mr Pashley has been put in charge of a confiscated Tamagotchi, and Miss Turner is hoping that this muck-up day goes smoother than the last. Tobias, the German language assistant, watches on. Things can only get better. 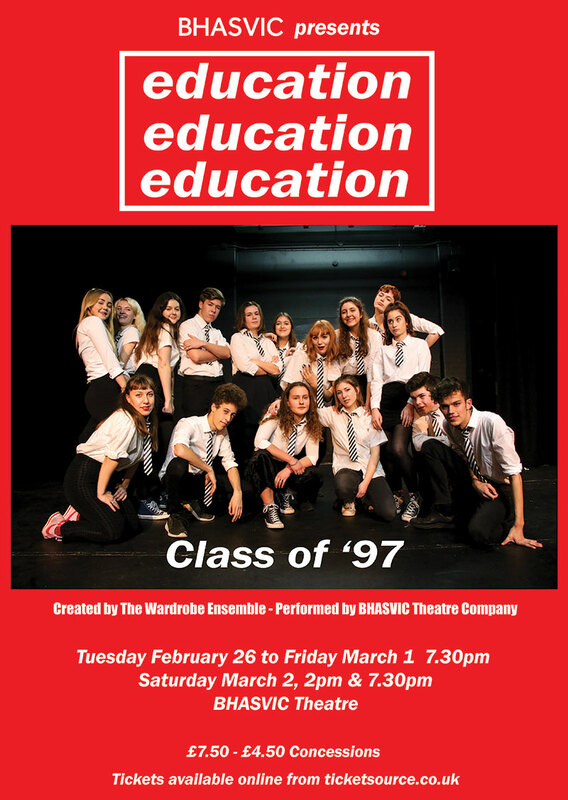 Education, Education, Education is The Wardrobe Ensemble’s love letter to the schools of the 1990’s and asks big questions about a country in special measures, exploring what we are taught and why, and where responsibility lies. Inventively theatrical and irreverently funny, Education, Education, Education was co-produced with Royal & Derngate, Northampton, and Shoreditch Town Hall. It premiered at the Edinburgh Festival Fringe in 2017, where it won a Fringe First Award, before touring the UK.